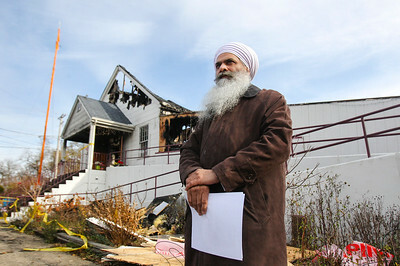 Sarah Nader- snader@shawmedia.com Baba Daljit Singh, the pastor of Guru Nanak Sikh Mission temple, stands outside the temple on Wednesday, November 12, 2014 after a fire occurred Tuesday night at the Guru Nanak Sikh Mission located at 217 W. State Road in Island Lake. Unable to successfully extinguish the fire from inside because of hidden flames in the walls and higher floors, firefighters eventually put it out from the outside using handlines and aerial master streams. Sarah Nader- snader@shawmedia.com Icicles formed after area firefighters put out a fire at the Guru Nanak Sikh Mission in Island Lake. According to the National Weather Service, temperatures are expected to be in the low 30's for the remainder or the week. 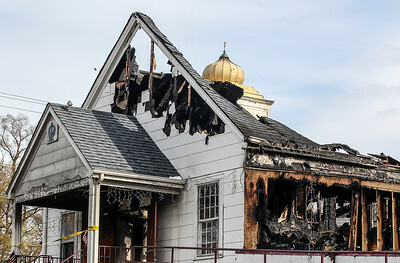 Sarah Nader- snader@shawmedia.com The aftermath from a fire that occurred Tuesday night at the Guru Nanak Sikh Mission located at 217 W. State Road in Island Lake Wednesday, November 12, 2014. Unable to successfully extinguish the fire from inside because of hidden flames in the walls and higher floors, firefighters eventually put it out from the outside using handlines and aerial master streams. 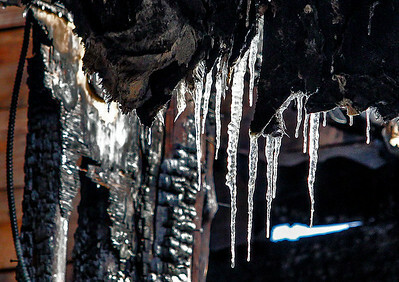 Icicles formed after area firefighters put out a fire at the Guru Nanak Sikh Mission in Island Lake. According to the National Weather Service, temperatures are expected to be in the low 30's for the remainder or the week.